In the wake of the 2009-2010 H1N1-pandemic, also known as the swine flu, a web of mistrust between the public and health authorities was spun. National pandemic plans were usually based on a single scenario that was more severe than the actual 2009 pandemic, and that was extrapolated from the severity of previous outbreaks like SARS and Avian flu. In effect the 2009 pandemic was nicknamed the false-pandemic or ‘the pandemic there never was’. However, national health authorities had declared a pandemic and bought vaccines for billions. Such an approach was blamed as too much alarmistic, and left institutions open to criticism and suspects. Engaging citizens in pandemic preparedness and response might be an effective way to deal with this issue. Hereto, ASSET project aims to be EU’s counter to this by engaging citizens in the debate of pandemic crisis prevention and management. The Danish Board of Technology was asked to develop and test a participatory and inclusive method for engaging citizens. The method should convince the EU that citizen participation could be done within a field normally dominated by technical experts. In fact, epidemic response and planning has clear normative components, involving obvious conflicts and dilemmas, combined with a well-documented scientific knowledge base, and a need for political action in the crisis situation and fulfilling all conditions for citizen participation. We decided to develop a multi-site method, where the citizens received the same information prior and during the consultations at the same time across Europe. Their votes were reported in real time into a webtool, were all the results can be seen and analysed. See Box2 for more information. The citizen were very satisfied with the process and would like the process to be repeated on different or similar issues. They provided policy makers with clear demands and thought-provoking insights. Analysis of the results are still ongoing, but some trends are already now evident. Citizens want more transparency in the work of health authorities and are not satisfied with the level of information provided during epidemic threats. Actually, less than half of the citizens are confident with information being withheld, even for security reasons by health authorities. Same goes for the satisfaction level during an epidemic threat. Some of the more remarkable results from the consultation included vaccination and information channels. While half of the citizens found mandatory vaccination as an appropriate tool for public health authorities during epidemic threats, more than eight-of-ten answered that it should be mandatory for health care workers (Figure 1). This discrepancy is very interesting, and we will go more into detail in upcoming policy workshops in Bruxelles. As mentioned in the lead paragraph, an insight that policy makers cannot overlook is that the citizen deems the internet as the least trusted information channel, and yet it is the one they consult first. Research has showed that even if this insight, information read online has a subconscious effect on decision-making. Finally, we organized an open session where the citizens were asked to write policy recommendations in their native language. In addition to their recommendations, they were asked to encircle the most important words from their policy recommendations. The words have been translated and mapped according to the citizens’ priorities through a co-hashtag analysis (Figure 2). What we can see from this map is that information, transparency and citizens are very central and important to the citizens. 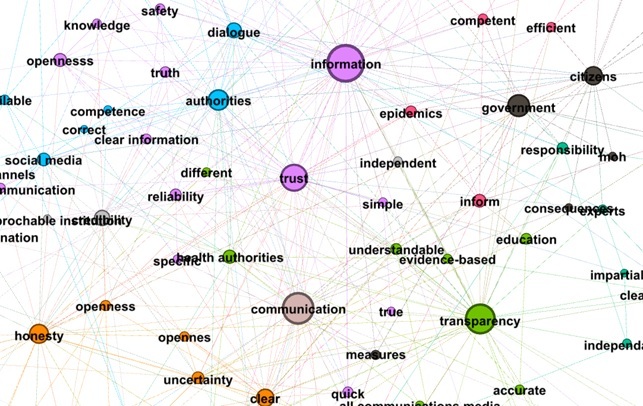 By investigating the full recommendations behind these keywords, it is possible to explore the context behind the most popular recommendation, thus providing a helpful set of information for policy makers on such a delicate matter.